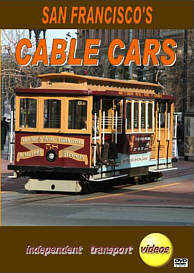 Welcome to an independent transport videos first as we focus on the Cable Car system of San Francisco. We start this video programme on a bright and busy morning at the Market Street terminus on the Powell – Mason line. Our cameras follow the cars on the Powell - Mason line to California Street junction where we view cars passing and picking up passengers in the street. We continue the route to Washington Street where our video cameras pause to enjoy some more action of cars passing the Cable Car Barn. We then take an exclusive look behind the scenes at the cable machinery that is used for propelling the cars, before our cameras take a brief look inside the barn at out of service cars. Back out on the street we observe some training in action along a stretch of Mason Street, whilst witnessing the cars negotiating the hills between the barn and the Fisherman’s Wharf terminus. Here we take a look at the cars being turned ready for their return journey to Market Street. Our cameras then move across town to the terminus of the Powell – Hyde Line where we see cable cars negotiate the steep incline of Russian Hill. After following the cars up the hill, we stop for some picturesque scenes of the cars climbing the hills with spectacular views of Alcatraz and San Francisco bay. We continue to the Market Street terminus and see the cable cars operating in the evening time. You can experience the excitement of a cable car journey as we ride the Powell – Mason line, listen to the sounds and see the sights of the city passing by. The third line we showcase is that of California Street, where we see double ended cars travelling along the downtown roads to the Van Ness terminus. We pause along the way for some scenes of the Cable Cars in front of the Trans America pyramid. To conclude we enjoy further scenes of the California Street line as we ride a car back to Market Street through the different landscapes of the city of San Francisco. So all aboard and enjoy the ride!